SPR is a gold standard technique used in the biotechnology industry to measure binding kinetics and molecular interactions. This data is of critical importance – it helps scientists understand how diseases work, helps them to design the next blockbuster drug, and helps ensure biosimilars meet FDA regulations, just to name a few examples. So why isn’t SPR being taught to young scientists in college and university, alongside other standard techniques like western blot, ELISA, or HPLC? One big reason is the cost, and the other is the complexity. Luckily, OpenSPR solves these problems, and is a perfect addition to help modernize teaching labs, bringing them into the 21st century and ensuring your students have the skills they need to be competitive and successful. In this blog post, we will highlight why teaching labs need to adopt SPR and how they can do this effectively and within budget with Nicoya’s OpenSPR. As you might already know, surface plasmon resonance (SPR) is a gold standard biosensor technology used in the lifesciences and pharmaceutical industry. SPR is an optical label-free method of analyzing binding interactions between biomolecules. Basic research such as discovering and characterizing protein function, disease mechanisms, etc. Unlike the typical detection technologies like ELISA, SPR does not require the use of a labeling molecule! This allows for interaction measurements in real time, avoiding time consuming, expensive, and hazardous labeling steps. This means that with real time measurement, you can determine on and off kinetics, affinity, specificity, and more. The versatility of SPR biosensors has led them to become a standard biophysical tool in both lifescience and pharmaceutical research. However, SPR instruments are traditionally complicated devices that are expensive to purchase, maintain, and operate, so it’s no surprise that this technique has not been introduced to laboratory classes at the undergraduate level. We saw this problem as a perfect opportunity for our benchtop SPR system to make an impact. The OpenSPR system is less expensive and significantly easier to operate in many ways. It’s a much shorter learning curve for students. My students learned in a few hours how to handle it. Why do You Need to Teach SPR? Scientists are a driving force in the global economy. We need to train our scientists better, so they can have enough hands-on experience to innovate and make an impact in the industry they were trained for. Hence, it’s important for universities and colleges to stay competitive by adopting modern technologies that students can use productively and find relevant to their future employment. Universities like Waterloo and Toronto were established with the purpose of teaching industry standards and relevant skills. When labs are filled with equipment that are no longer relevant in the 21st century, it undermines the university’s mission to better prepare our students for the industry. SPR is a technique that has been growing in popularity and importance in both research and industry. It is used by thousands of biotechnology companies and every pharmaceutical company in the world, and it is time that students be taught these skills. SPR is critical to our drug discovery process, and scientists who are trained with these skills will be better prepared for a career at a company like AstraZeneca. As further evidence to the increasing importance of SPR, scientific publications involving SPR have increased drastically recently. 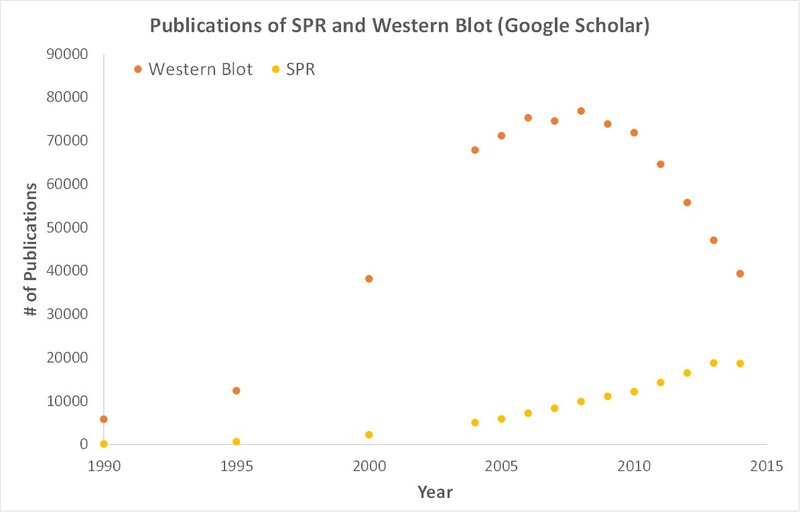 As shown in the graph below, SPR is gaining attention while older techniques like Western blot are becoming obsolete. More evidence of the importance and impact of SPR can be seen by looking at the global market sizes for various biochemistry lab techniques currently being taught to students. In fact, the market for SPR is growing at over 2X the rate of all other conventional techniques. It is clear that SPR is playing a critical role in the biotechnology industry, so it is time that we start giving scientists the skills they need to succeed. Why OpenSPR for Teaching Labs? It is clear that SPR needs to be taught to students, but the high cost of the instrumentation ($150k+), high cost of consumables ($150-$600 per sensor), and expensive maintenance have prevented labs from integrating it into the curriculum. It just isn’t practical to have undergraduate students using equipment that is this complicated and expensive. At Nicoya, we created the OpenSPR instrument that is designed to be a powerful research tool but also undergraduate-friendly and ideal for an educational lab setting. It’s a compact benchtop solution that uses nanotechnology to reduce the cost and complexity of the instrumentation without sacrificing on performance. The OpenSPR design allows for easy integration and provides a great teaching tool for students to understand modern instrumentation. Students can gain deeper understanding of biophysical processes with real time kinetic data. They can also become exposed to leading edge biosensor technology and core SPR concepts, both in theory and in practice. Finally, you can cultivate a culture of employable students. With OpenSPR, students can ultimately gain hands on experience with a highly demanded industry standard analytical technique. 1. Easy to use – OpenSPR is a compact, easy-to-use solution that is designed to allow students to work in groups productively and efficiently in a reasonable 2-4 hour timeframe. Our system can be easily integrated into any lab, saving you, the busy lab instructor, the hassle and time needed for development. Simple maintenance is the icing on the cake. 2. Affordability – The nature of our innovative sensor technology allows us to provide the holistic solution to you at a fraction of the cost. Affordable sensor chips won’t drain your teaching budget, even if a student breaks a sensor chip or two. On top of that, you can afford to have multiple instruments so everyone can get hands on experience. 3. Industry Approved – Lab instructors, this is for you. We know you strive to educate your students and prepare them for the real world. Become the educator you want to be by providing your students with the right skills for their future careers. Check out what other lab instructors had to say about OpenSPR or touch base with us if you have any questions or concerns. With the above mentioned benefits, lab instructors will be able to enhance lab content by incorporating leading edge instrumentation and the latest technique with ease. Ready to integrate OpenSPR into your lab? We would be happy to help you design experiments that fit your needs. Get started today by signing up and speaking with our educational experts to find out how easy it actually is to integrate OpenSPR into your lab. With OpenSPR, students can actually do the work themselves in small groups, giving them a far greater impact and learning advantage. They can work with the system themselves; that’s really cool.